I was chatting via Skype with a friend of mine and he said something smart, so I wrote the word "EVIL" and held it up to the cam. Later on in the same conversation, I flipped the sketchpad over and wrote "POOKIE." Today I decided to use the page for an impromptu sketch. When I was young, I drew lots of monsters. I'm good at them. This is probably the first one I've done in ages. Some psychologist somewhere will probably make a big deal about how much bigger the EVIL monster is bigger than the big-eyed POOKIE surrounded by little hearts. 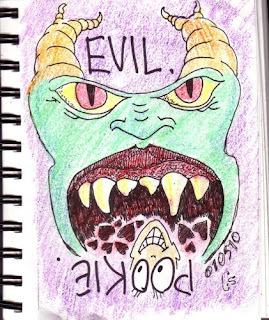 EVIL eats POOKIE as we all know, and that's the way the sketch turned out. That's the way it is in real life. I also have to remark how odd it is to sign these drawings with the initials "CS." But it goes with making Calamari the guise under which I'm conducting this experiment. It just occurred to me that an experiment in secrets and truth under a pseudonym is possibly ironic. Please note that this is the first time I have ever claimed irony. That's my true thing for the day.